A magnolia stem cutting has been coaxed to form new roots, and is now a complete plant. A plant cutting is a piece of a plant that is used in horticulture for vegetative (asexual) propagation. A piece of the stem or root of the source plant is placed in a suitable medium such as moist soil. If the conditions are suitable, the plant piece will begin to grow as a new plant independent of the parent, a process known as striking. A stem cutting produces new roots, and a root cutting produces new stems. Some plants can be grown from leaf pieces, called leaf cuttings, which produce both stems and roots. 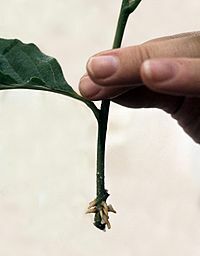 The scions used in grafting are also called cuttings. Propagating plants from cuttings is an ancient form of cloning. There are several advantages of cuttings, mainly that the produced offspring are practically clones of their parent plants. If a plant has favorable traits, it can continue to pass down its advantageous genetic information to its offspring. This is especially economically advantageous as it allows commercial growers to clone a certain plant to ensure consistency throughout their crops. The poet Theodore Roethke wrote about plant cuttings and root growth behavior in his poems "Cuttings" and "Cuttings (Later)" found in his book The Lost Son: And Other Poems. Cuttings are used as a method of asexual reproduction in succulent horticulture, commonly referred to as vegetative reproduction. A cutting can also be referred to as a propagule. Succulents have evolved with the ability to use adventitious root formation in reproduction to increase fitness in stressful environments. Succulents grow in shallow soils, rocky soils, and desert soils. Seedlings from sexual reproduction have a low survival rate; however, plantlets from the excised stem cuttings and leaf cuttings, broken off in the natural environment, are more successful. Cuttings have both water and carbon stored and available, which are resources needed for plant establishment. The detached part of the plant remains physiologically active, allowing mitotic activity and new root structures to form for water and nutrient uptake. Asexual reproduction of plants is also evolutionarily advantageous as it allows plantlets to be better suited to their environment though retention of epigenetic memory, heritable patterns of phenotypic differences that are not due to changes in DNA but rather histone modification and DNA methylation. Epigenetic memory is heritable through mitosis, and thus advantageous stress response priming is retained in plantlets from excised stem. Adventitious root formation refers to roots that form from any structure of a plant that is not a root; these roots can form as part of normal development or due to a stress response. Adventitious root formation from the excised stem cutting is a wound response. At a molecular level when a cutting is first excised at the stem there is an immediate increase in jasmonic acid, known to be necessary for adventitious root formation. When the cutting is excised from the original root system the root inhibiting hormones, cytokinin and strigolactone, which are made in the root and transported to the stem, decrease in concentration. Polyphenol degradation decreases, increasing auxin concentration. The increased auxin concentration increases nitric oxide concentration which initiates root formation through a MAPK signal cascade and a cGMP-dependent pathway that that both regulate mitotic division and are both necessary for the initiation of adventitious root formation. The root primordia form from cambial cells in the stem. In propagation of detached succulent leaves and leaf cuttings, the root primordia typically emerges from the basal callous tissue after the leaf primordia emerges. It was known as early as 1935 that when indolyl-3-acetic acid (IAA), also known as auxin, is applied to the stem of root cuttings, there is an increase the average number of adventitious roots compared to cuttings that are not treated. Researchers also applied this compound to stems without leaves that normally would not have any root formation and found that auxin induced root formation, thus determining auxin is necessary for root formation. Identification of this hormone has been important to industries that rely on vegetative propagation, as it is sometimes applied to fresh cuttings to stimulate root growth. Softwood cuttings of elm (Ulmus) are kept under a water mist to prevent them from drying out while they form roots. Cuttings from a variety of succulents. Softwood cuttings come from stems that are rapidly expanding, with young leaves. In many species, such cuttings form roots relatively easily. Semi-hardwood cuttings come from stems that have completed elongation growth and have mature leaves. Hardwood cuttings come from fully matured stems, and are often propagated while dormant. Most plant cuttings are stem pieces, and have no root system of their own, they are likely to die from dehydration if the proper conditions are not met. They require a moist medium, which, however, cannot be too wet lest the cutting rot. A number of media are used in this process, including but not limited to soil, perlite, vermiculite, coir, rock wool, expanded clay pellets, and even water given the right conditions. Most succulent cuttings can be left in open air until the cut surface dries, which may improve root formation when the cutting is later planted. In temperate countries, stem cuttings may be taken of soft (green or semi-ripe) wood and hard wood which has specific differences in practice. Certain conditions lead to more favorable outcomes for cuttings; timing, size, location on the plant, and amount of foliage are all important. Stem cuttings of young wood should be taken in spring from the upper branches, while cuttings of hardened wood should be taken in winter from the lower branches. Common bounds on the length of stem cuttings are between 5–15 centimetres (2.0–5.9 in) for soft wood and between 20–25 centimetres (7.9–9.8 in) for hard wood. Soft wood cuttings do best when about two thirds of the foliage removed, while hard wood stem cuttings need complete foliage removal. The cut needs to be done either immediately below a node, or upto 1/2 inch below a node. The environment for cuttings is generally kept humid—often attained by placing the cuttings under a plastic sheet or in another confined space where the air can be kept moist—and partial shade to prevent the cutting from drying out. Cuttings in the medium are typically watered with a fine mist to avoid disturbing plants. Following the initial watering, the aim to keep the soil moist but not wet and waterlogged; the medium is allowed to almost dry out before misting again. A rooting hormone may be administered to "encourage" growth and can increase the success rate of plant growth. Though not essential, several compounds may be used to promote the formation of roots through the signaling activity of plant hormone auxins. Among the commonly used chemicals is indole-3-butyric acid (IBA) used as a powder, liquid solution or gel. This compound is applied either to the cut tip of the cutting or as a foliar spray. Rooting hormone can be manufactured naturally, such as soaking the yellow-tipped shoots of a weeping willow tree in water or to preparing a tea from the bark of a willow tree. Shoots or bark do better when soaked for 24 hours prior to using. The extract obtained from the crushing of leaves and bulbs of coco-grass (Cyperus rotundus) is used as an excellent rooting of cuttings and seedlings of various plant species. Honey, though it does not contain any plant hormones, can also aid in rooting success through its natural antiseptic and antifungal properties. Cinnamon or an Aspirin tablet in water, can also aid the rooting process. For cuttings used in viticulture, see Propagation of grapevines. Scheme of appropriate type of stem cuttings according to season. Key: eq. :equinox, sol. : solstice, HW: hardwood, SR: semi-ripe, SW: softwood. Stem cuttings, in which a piece of stem is part buried in the soil, including at least one leaf node. The cutting is able to produce new roots, usually at the node. Root cuttings, in which a section of root is buried just below the soil surface, and produces new shoots. Leaf cuttings, in which a leaf is placed on moist soil. These have to develop both new stems and new roots. Some leaves will produce one plant at the base of the leaf. In some species, multiple new plants can be produced at many places on one leaf, and these can be induced by cutting the leaf veins. The leaf cutting method is commonly used with succulents. Although some species, such as willow, blackberry and pelargoniums can be grown simply by placing a cutting into moist ground, the majority of species require more attention. Most species require humid, warm, partially shaded conditions to strike, thus requiring the approach above to be followed. Particularly difficult species may need cool air above and warm soil. In addition, with many more difficult cuttings, one should use the type of cutting that has the most chance of success with that particular plant species. There are ways of improving the growth of stem cutting propagations. Intensifying light allows cuttings to root and sprout faster, though the heat thus generated could cause the propagation material distress. Azalea cuttings can be mildly heated in water to disinfect it from the fungus pathogen Rhizoctonia, and this could potentially be used for other plants. For example, with plain potting soil, a third of the container should be filled with sand, to make suitable soil for cuttings. Although several options can be used here, usually semi-white plastic is used to cover the cuttings. The soil below and from the cuttings themselves is kept moist, and should be aerated once in a while to prevent formation of molds. A plastic bottle can be used as a small greenhouse to provide the right humidity level. Propagated by cuttings, Inch Plants can be moved easily as its stolons cling lightly to the ground. Pelargonium x hortorum (garden geraniums) are propagated by seeds and cuttings. A houseplant, purple-heart is propagated by cuttings (the stems are visibly segmented and roots will frequently grow from the joints). A succulent, Echeveria derenbergii is propagated by producing a colony of small offsets which can be separated from the parent plant. Aptenia cordifolia can easily reproduce from cuttings of the developed stems, roots, and even from its own buried leaves. Plectranthus scutellarioides is easily propagated from stem cuttings readily in plain water, without the addition of rooting hormone. To note, some plants, such as Coleus, Maranta and Golden Pothos, among others, listed above, may require water for them to root before they can be transplanted to soil. ^ McKey, Doyle; Elias, Marianne; Pujol, Benoît; Duputié, Anne (2010-04-01). "The evolutionary ecology of clonally propagated domesticated plants". New Phytologist. 186 (2): 318–332. doi:10.1111/j.1469-8137.2010.03210.x. ISSN 1469-8137. PMID 20202131. ^ Hussey, G. (1978). "The application of tissue culture to the vegetative propagation of plants". Science Progress (1933- ). 65 (258): 185–208. JSTOR 43420451. ^ Roethke, Theodore (1948). The Lost Son: And Other Poems. ^ a b c Gravatt (December 2004). "Description of Asexual Reproduction in a Texas succulent Sedum Wright 2 (Crassulaceae)" (PDF). SIDA, Contributions to Botany. 21 (2): 943–950. ^ a b Crisp, Peter A.; Ganguly, Diep; Eichten, Steven R.; Borevitz, Justin O.; Pogson, Barry J. (2016-02-01). "Reconsidering plant memory: Intersections between stress recovery, RNA turnover, and epigenetics". Science Advances. 2 (2): e1501340. doi:10.1126/sciadv.1501340. ISSN 2375-2548. PMC 4788475. PMID 26989783. ^ a b c d Steffens, Bianka; Rasmussen, Amanda (2016-02-01). "The Physiology of Adventitious Roots". Plant Physiology. 170 (2): 603–617. doi:10.1104/pp.15.01360. ISSN 0032-0889. PMC 4734560. PMID 26697895. ^ Rasmussen; Hossseini; Hajirezaei; Druege; Geelen (2015). "Adventitious rooting declines with the vegetative to reproductive switch and involves a changed auxin homeostasis". Journal of Experimental Botany. 66 (5): 1437–1452. doi:10.1093/jxb/eru499. PMC 4339602. PMID 25540438. ^ Pagnussat, Gabriela Carolina; Lanteri, María Luciana; Lombardo, María Cristina; Lamattina, Lorenzo (May 2004). "Nitric oxide mediates the indole acetic acid induction activation of a mitogen-activated protein kinase cascade involved in adventitious root development". Plant Physiology. 135 (1): 279–286. doi:10.1104/pp.103.038554. ISSN 0032-0889. PMC 429373. PMID 15122018. ^ Gravatt (December 2004). "Description of Asexual Reproduction in a Texas succulent Sedum Wright 2 (Crassulaceae)" (PDF). SIDA, Contributions to Botany. 21 (2): 943–950. ^ Cooper, William C. (October 1935). "Hormones in relation to root formation of stem cuttings". Plant Physiology. 10 (4): 789–794. doi:10.1104/pp.10.4.789. ISSN 0032-0889. PMC 439200. PMID 16653316. ^ "How to take softwood cuttings". gardenersworld.com. Retrieved 1 October 2017. ^ a b Buchan, Ursula (3 April 2010). "How to take plant cuttings". The Telegraph. Retrieved 3 October 2017. ^ "How to grow plants using cuttings". readersdigest.co.uk. Retrieved 2 October 2017. ^ "How to make your own rooting hormone". Pioneerthinking.com. 2005-11-02. Archived from the original on 2010-02-26. Retrieved 2010-02-21. ^ Oliver, R. W. "Honey as a stimulant to the rooting of cuttings." Scientific Agriculture 19.9 (1939): 586-588. ^ Tilley, Nikki. "Honey As A Root Hormone: How To Root Cuttings With Honey". gardeningknowhow.com. Retrieved 2 October 2017. ^ Larqué-Saavedra, Alfonso, and Rodolfo Martin-Mex. "Effects of salicylic acid on the bioproductivity of plants." Salicylic acid: A Plant Hormone. Springer, Dordrecht, 2007. 15-23. ^ Wong, James (31 January 2016). "Gardens: drug therapy for plants". The Guardian. Retrieved 2 October 2017. ^ Carroll, Jackie. "What Are Root Cuttings: Information On Taking Cuttings From Root Growth". gardeningknowhow.com. Retrieved 2 October 2017. ^ "Certain plant species having more success with certain types of cuttings". Healthrecipes.com. Retrieved 2010-02-21. ^ Wallheimer, Brian (January 23, 2012). "Study shines light on ways to cut costs for greenhouse growers". Lopez and Currey. Purdue University. Retrieved July 31, 2012. ^ Yao, Stephanie (December 24, 2009). "Hot Water Treatment Eliminates Rhizoctonia from Azalea Cuttings". USDA Agricultural Research Service. Physorg. Retrieved July 31, 2012.